A large silver bowl of circular form. 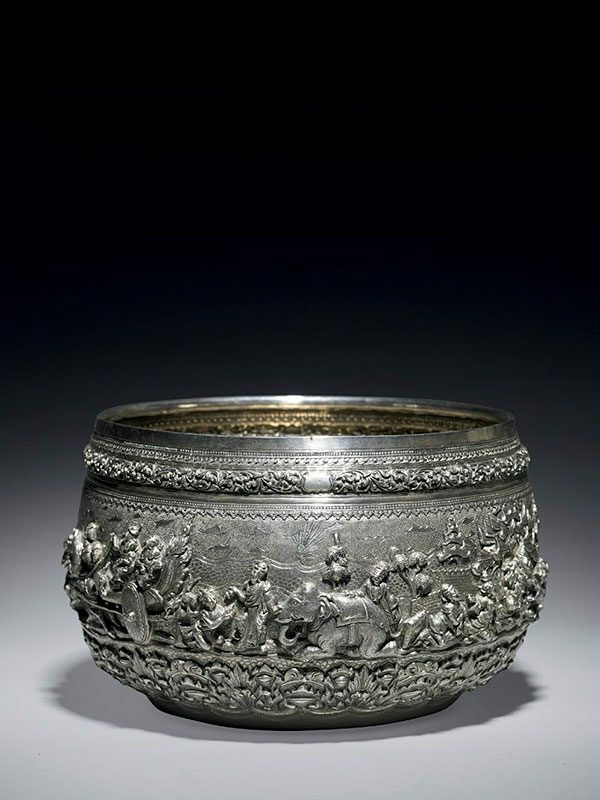 The surface of the bowl is embellished with a continuous band of embossed and chased repoussé decoration, depicting a series of iconic Burmese figures in high relief, wearing courtly and traditional dress, accompanied by a variety of animals such as an elephant, a horse and a mythical lion. The scenic ornamentation is positioned amidst bands of scrolling stylised leaf ornamentation, made in deep rich repoussé. The top rim shows four plain banners, two which are engraved, one saying ‘SUB-LESSEE’ the other ‘MG. SWAI’. The underside of the bowl is engraved with a central lobed motif and shows a juggler standing on a horse holding a figure on each arm. There are no hallmarks, as expected with this type of Asian silverware. The continuous frieze of figures on this exquisite and exceptionally large silver bowl relates to Burmese folklore. The form is based on alms or begging bowls, thabeik, used by Burmese monks. Monks in general did not own any silver bowls because it was forbidden for them to touch silver or gold. Some monks circumvented this prohibition by giving their attendant the silver bowl to carry for them. This type of bowl was adapted for local Burmese aristocracy and European clients and eventually took on a more ornamental role. Thabeik bowls have no ceremonial or religious use; they are purely ornamental. Burmese silver and goldsmiths were known for this type of delicately chased metalwork before their style became affected by the late 19th century European taste for flamboyant decoration. The present bowl was probably made for the Burmese market, before any European influence.